In the vision that preceded the founding of the Visitation of Holy Mary, Francis saw, at the bottom of the valley, a tree whose branches spread out and crossed over the mountains. He then knew that the new order would extend throughout the whole earth. The Visitation is a mystery of relationship, as contemplatives we believe that our place in the Church today is the same as it was in former times ~ at its heart, and that we are called to witness the importance of prayer. 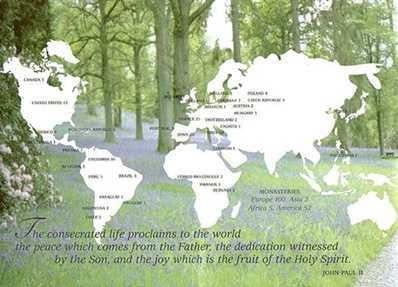 This defines for us a way of 'being' and of living community ~ this is our gift to the Church and to our world.